Enhance your iPhone or iPod Touch videography with the Lume Cube iOS Video Kit. 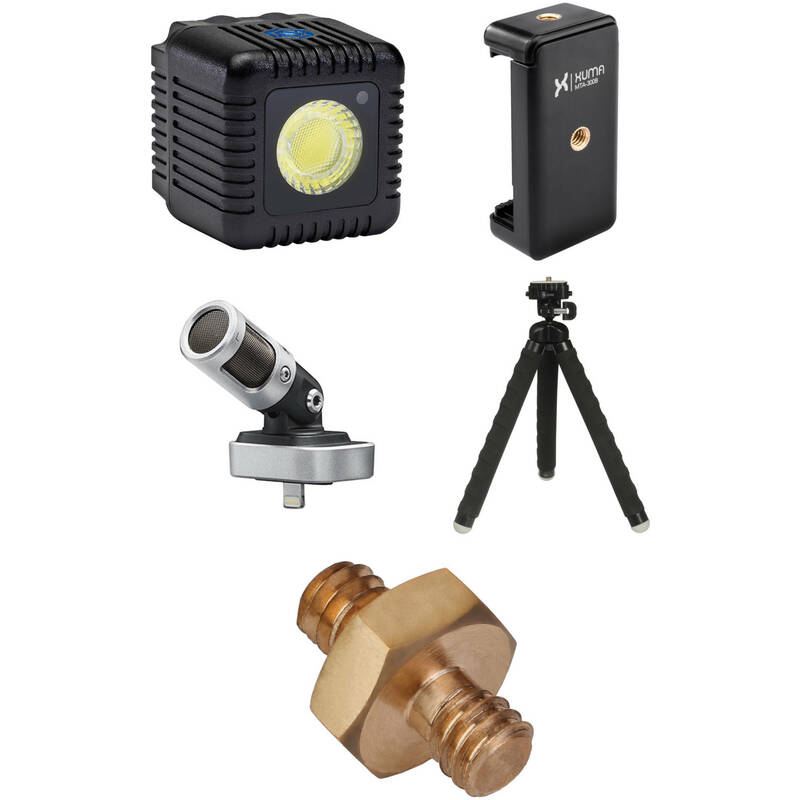 This B&H Kit features the Lume Cube 1500 Lumen Light in black, which is dimmable and has a 6000K color temperature for even, natural lighting. The Shure MOTIV MV88 stereo condenser microphone slots directly into your device's Lightning port for recording high-quality audio. Finally, a 9.7" flexible tripod lets you position your iPhone or iPod where you'd like, and holds devices 2.4 to 3.25" wide thanks to the included smartphone mount. You'll never miss a photo for lack of a tripod when you have the MaxiGrip Flexible Tripod (Black) from Magnus. It weighs only 6 oz - you can carry it with you 24/7. It has flexible legs that can be bent 360° to wrap around a fence, a tree branch, a chair leg or anything else stable enough to hold a small camera and small enough to wrap the legs around. It has a 9.7" maximum height and includes a flat head that supports a point-and-shoot camera or pocket video camera weighing up to 2.2 lb. The flexible legs are covered with a protective foam shell, and rubber feet give you a stable support when using the tripod traditionally, with all three feet on a flat surface. The ball head has a standard 1/4"-20 mounting screw, and features a quick release system. Box Dimensions (LxWxH) 4.5 x 1.8 x 1.0"
Box Dimensions (LxWxH) 4.9 x 3.7 x 2.9"
Box Dimensions (LxWxH) 12.0 x 2.0 x 1.9"
Box Dimensions (LxWxH) 6.2 x 3.55 x 0.7"
iOS Video Kit is rated 5.0 out of 5 by 1. Rated 5 out of 5 by World Traveler from Much Needed Nightlight For Photos And Videos Absolutely The Best Product On The Market. When It Comes To Portability. When Wanting To Take Photos And Videos On The Go.Theirs No Substitute And The Amout Of Convenience That These Lights Bring Out Of Your Photos During Night Shooting. Thx LUME CUBE For Making A Good Product.